Protect from drafts! Using a draft snake to place under your door will allow you to keep the warm air in your house, while keeping the cold air out. The U.S. Department of Energy claims that drafts can be attributed 5-30% of energy use per year. Use bubble wrap on your windows. For older windows, there could be cracks allowing cold air in. If you tape bubble wrap to the windows it will block the cold air from entering your home, as well as letting light in your house still! This trick will also help reduce the 5-30% of energy wasted by drafts. Seal the gaps with caulking. Cracks and spaces in windows, doors, and walls are also allowing drafts of cold air into your house. By spending the few dollars that caulking costs, you will be able to save energy! Reverse the fans. Ceiling fans have a few settings on them, and one reverses the direction that the fan spins. By reversing the direction of the fan, it will actually push warm air throughout the room, allowing you to lower the thermostat a few notches. The Daily Green claims this could end up saving on about 10% of heating costs. Install a storm door. If you aren’t keen on sealing your doorway cracks with caulking, you can install a storm door, increasing your energy efficiency up to 45%! Control the thermostat. During the day, having your house at a comfortable heat is a luxury that sometimes comes with guilt. Leave the heat where you’re comfortable, but when you go to bed, drop the temperature down to 50-55 degrees and rely on blankets to warm you up. Keeping the temperature down 10-15 degrees for eight hours a day can save 10% per year on your energy bill. Insulate! As heat naturally rises, it is important to make sure that the top of your home is properly insulated! By keeping the heat insulated in the house, you will save on the quarter of heat lost through the roof. Remove any window A/C units. Cold air is constantly trying to get into your house, and the gaps that the window unit creates will allow large amounts of cold air in during the winter. This will also help reduce the 5-30% of wasted energy due to drafts. Turn off the A/C water valve. By turning off the water valve, you will save your A/C unit for next summer. Stopping the water flow and draining the pipes conserves the A/C unit, making it last longer. Turn the water heater’s temperature down. Chances are, you don’t use your water on its hottest setting at all time. You can actually lower the heat that your water heater is set at, from its normal 140 degrees Fahrenheit, down to a comfortable 120 degrees Fahrenheit. Lowering the water heat 20 degrees can save you 6-10% on your energy bill according to Energy Savers. 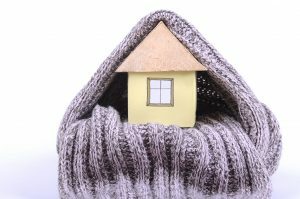 Jack Frost will always want to sneak into your home, but follow all or even a few of these tips to save, and it will help you stay comfortable and economical! If you need to consider a move to a warmer location or anywhere else, LDSAgents.com can help you find the best realtor for you and your family!